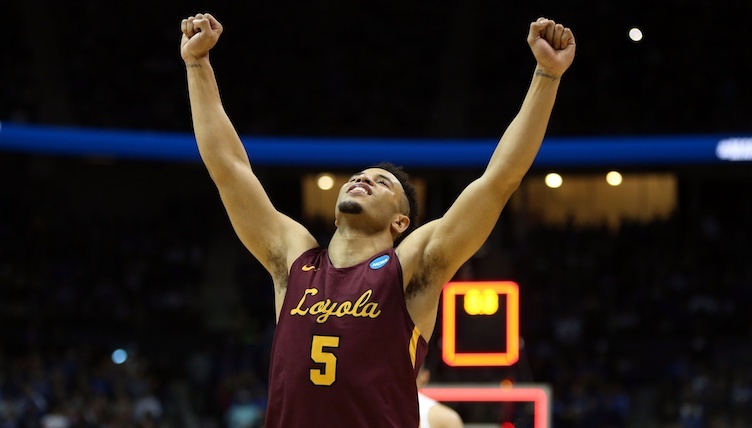 Loyola-Chicago is just one win away from the tournament's most improbable Final Four berth since George Mason's miracle run in 2011. The Loyola-Chicago Ramblers put in a great, albeit surprising regular season. They won the Missouri Valley’s regular season championship with a 15-3 record in league play, picked up 28 wins before the NCAA Tournament started, and grabbed a non-conference win over the Florida Gators. That, plus an RPI of 28 was enough to earn them an 11-seed in arguably this year’s “toughest” region on Selection Sunday. The South region featured No. 1 overall seed Virginia, plus Cincinnati, Tennessee, Arizona and Kentucky. Loyola’s first-round matchup against Miami wasn’t exactly favorable. It would take a big effort just to get out of round one, never mind to the second weekend. Only 13 days after Selection Sunday, the Ramblers sit on the cusp of the Final Four — an Elite 8 matchup with a similarly surprising (9-seed) Kansas State Wildcats squad. Vegas sees them as 1.5-point underdogs, a virtual pick ’em for the former longshot. On Saturday, it’s highly possible that Loyola-Chicago is headed to its second Final Four in program history. Despite an NCAA Tournament where a No. 16 upset a No. 1 seed and another 11-seed (Syracuse) has also advanced to the second weekend, Loyola, its last-second heroics and now iconic Sister Jean are THE storyline. The Ramblers are far from the first so-called “mid-major” to make it this far, and there’s still a list of others who’ve gotten their way to the Final Four. But those instances weren’t really this. Loyola isn’t an annual bracket-buster or upset pick. They’re not even perennial contenders in the Missouri Valley Conference. This season’s first-place finish was 31 years removed from their last one (in the Horizon League). It’s the Ramblers’ first NCAA Tournament bid since 1985, when they were beaten by juggernaut Georgetown in the Sweet 16. Prior to that season, they made four NCAA Tournaments in six years from 1963-68 — a stretch which, unbeknownst to many, actually started with a national title in 1963. But championship aside, it’s not as if Loyola’s been cashing that in for decades on end since. They were added to the league in 2013-14 to gain access to Chicago in the wake of realignment. This year was their first winning record in conference play since joining the MVC. And now, they could end up one of the most unlikely Final Four participants since 1985. Since television revenues became a larger part of college athletics, it’s been more difficult for mid-majors to compete. They don’t have the same access to resources or fan support or tradition. Their leagues don’t make anywhere near as much money as the power conferences. It’s hard to sustain success and those that do usually elevate themselves from mid-major status over time. From 1985 — the year the NCAA Tournament expanded to 64 teams — to now, 16 teams outside of the country’s seven best conferences have made the Final Four, and nearly all of them were established names already and remain so today. All but four have been top-four seeds as well. The 2006 George Mason team (11-seed), 2010 Butler (5), 2011 Butler (8) and 2013 Wichita State (9) are the lone exceptions. That said, the latter three were the established mid-major brand names. Even George Mason had become an annual CAA contender under now-Miami coach Jim Larranaga. If they can fight through one last game in the South bracket, Loyola would be in that rare space which is really only currently occupied by GMU in the modern NCAA Tournament. The list of “mid-majors” doesn’t necessarily highlight schools that defied the odds as much as those that fought their way into the establishment of the sport over time. Memphis, Louisville, Cincinnati, Utah, Butler and Wichita State are all on it, and all reside in one of the country’s top seven conferences today. Even Gonzaga, who’s remained an outsider since their tournament streak started 20 years ago, is now considering moving up to the Mountain West. The MWC is also where one-time Big West titan UNLV now sits. Even they, like all but two mid-major Final Four teams (UMass, GMU) eventually ended up switching leagues as a result of their success. Could that be in the cards for Loyola assuming they keep rolling through the 2018 NCAA Tournament? It’ll take some time to realize that goal, if it is one for the Ramblers. As mentioned, they’re coming out of nowhere like no team has before them — even fellow 11-seed George Mason. It takes time to build a reputation, but a Final Four trip this year would put Loyola on the road to doing so. In the meantime, they’ll probably take being the latest bracket buster and the most talked about team in the country.